The election was called for Senator (now President-Elect) Obama almost exactly 72 hours ago. 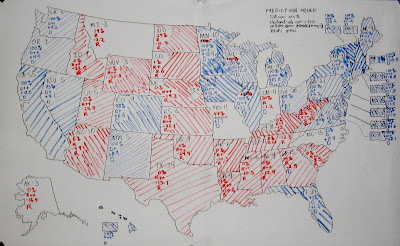 I hosted an election-night party with map & charts. Here's photos, as things were at the end of the night, and some additional thoughts with another three days of perspective. It looks pretty well wrapped up. Indiana (home state of my lovely FW, yay!) 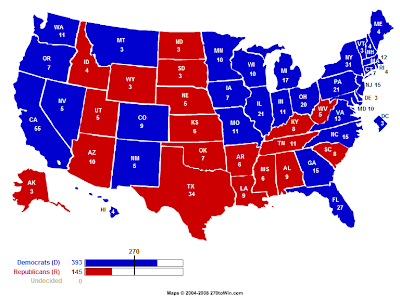 and North Carolina has since been called for Obama, Montana for McCain. Missouri will probably go McCain. The fun thing is that Nebraska will split its electoral votes, the first time that this has ever happened (Nebraska and Maine are the only states that aren't winner-takes-all). Voters in Nebraska's 2nd Congressional District (Omaha) will send one elector to vote for Barack Obama. That puts the final EV count at 365-173. My own prediction (393-145) proved too optimistic, as we lost Georgia, Montana, and Missouri, all of which I expected to win. However, we did win NE-02, which I did not expect. 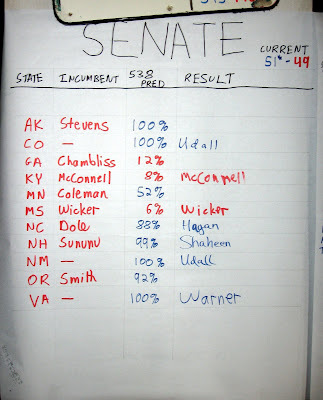 Ted Stevens (R-AK), convicted felon, wildly outperformed his polling. He is currently leading by 3,500 votes out of ~200,000 counted, and there are a bunch left to count, which Nate Silver thinks will favor Begich, the challenger. But regardless, this one wasn't supposed to be close. Seriously, Alaskans... you should be ashamed of yourselves. Saxby Chambliss (R-GA) is 3% ahead of Jim Martin, but a hair under 50%, so this one will go to a runoff on December 2. I can't figure out who's favored, but personally I think it'd be quite a surprise if Martin pulled it off. Norm Coleman (R-MN) is currently ahead by 221 votes, or 0.01%. Despite Colemans power-hungry demand on November 5 that Al Franken concede and waive his right to the automatic recount, this one will be hand recounted. The Secretary of State is a Democrat and a nerd, so it'll be fair. Some believe that the ballots without a machine-recorded vote favor Franken. Probably no resolution until December. I think our odds are no better than 50%. Gordon Smith (R-OR) was ousted by Jeff Merkley. The race was called on November 6. Democrats will flip at least 6 seats and Republicans none, for a 57-seat Democratic majority at minimum (counting Sanders and Lieberman, Lieberman's risk of being thrown out of the caucus notwithstanding). There's a lot being said about a 60-seat filibuster-proof majority, but in reality cloture votes rarely go along party lines. The power of Republicans to be obstructionist is much, much diminished even if they retain all three seats still unresolved. 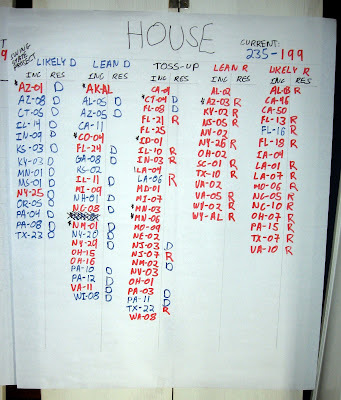 AK-AL: Alaskans unexpectedly re-elected disgustingly corrupt Don Young. Alaska, have you no shame? AZ-01: My mom's district, an open seat left by corrupt Rick Renzi (R). Flipped blue. AZ-03: The netroots had hoped to retire John Shadegg, member of the Republican House leadership, but failed. 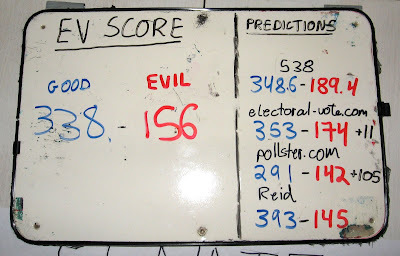 CO-04: Republican hate-monger Marilyn Musgrave, incumbent, was ousted. CT-04: Chris Shays, the only House Republican from New England remaining, was ousted. ID-01: Republican hate-monger and lunatic Bill Sali, incumbent, lost to Walt Minnik. 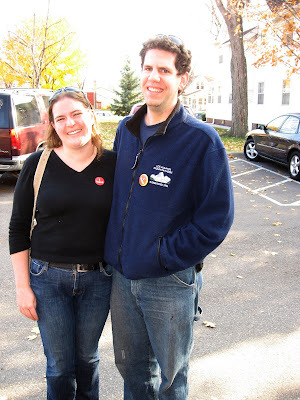 MN-03: Stayed red despite being an open seat in a swing district (Western Twin Cities suburbs). MN-06: Voters sent Republican gay-bashing fundamentalist embarrassment Heather Wilson back to Washington. Shame! NM-01: My home town's district. An open seat vacated by Heather Wilson (R) in her pursuit of New Mexico's Senate seat. She lost the primary. Now blue. NM-02: Another New Mexico flip, now blue. NM-03: Stayed blue. No surprise there, but New Mexico's Congressional delegation is now 100% Democratic. Everyone and everything I endorsed won, with the exception of the yet-to-be-resolved Coleman-Franken race. Wow! That doesn't happen to me very often. Your vote has a disproportionately high effect on downticket races. Yet, it's much harder to find information on those candidates. This is the reason why your vote is magnified... aside from the smaller voter pool to begin with, many people don't vote. For example, 646,000 people voted for President in Hennepin County in 2004, but only 330,000 voted in the contested Soil & Water Supervisor race (District 5). Therefore, here's my endorsements on the downticket races on my ballot (South Minneapolis). These aren't based on anything fancy; I just spent the hour reading through candidate statements in the Star Tribune (link) and looking at their websites so you don't have to. Also, I met my state representative, Jim Davnie, last week and took him to be a thoughtful, smart man who generally agreed with me, so I weighted his endorsements fairly highly in my thinking. You may wish to fill out a sample ballot and take it with you to the polls. As an aside, I will also be proudly voting for Barack Obama, Al Franken, Keith Ellison, and Jim Davnie (state House). "Clean water, wildlife, cultural heritage and natural areas". I will vote yes, though somewhat reluctantly. I do believe it is very important to fund these sorts of efforts. I do not believe it is appropriate to muck around in the state Contstitution for this sort of thing -- it's a funding decision, which is a job for the Legislature. It's a regressive tax, which I don't like. I am also concerned that the Legislature will simply trim discretionary funding, resulting in no net effect. However, I don't trust the Legislature to do much about increasing funding, and if they do, I expect Pawlenty to veto it. Also, the amendment sunsets in 25 years. I will vote for James Wisker. He's young, but he has a relevant degree, has relevant and reasonable opinions, and seems to be taking the race seriously. Richard A. Klatte - Does not appear to be serious. Candidate statement (in full): "Global Warming. Making big oil companies pay for cleaning the air, water, and soil they've destroyed." Rahn V Workcuff - Candidate statement is anti-gay-marriage rant. Ben Torell - Too corporate; candidate statement is ungrammatical and badly capitalized. Also, he's a snowmobile/ATV safety instructor, and I don't want anyone associated with those horrible machines anywhere near my soil and water. I suspect he may be a "wise use" right-winger. In this race I was not particularly happy with either candidate. However, I will vote for Jeffrey A. Beck (not the Jeff Beck who works in GroupLens) because he's not the other candidate. Karl Hanson - Anti-government right-winger. Candidate statement talks about property owners' right to "absolutely minimal government interference" and reducing taxes. Lydia Lee - Candidate statement seems reasonable and thoughtful. Endorsed by people I like. Also (and this is silly), she lives near one of my friends, whose neighbors like her. Carla Bates - Endorsements by people I like, including Davnie. Has a Ph.D. She is a lesbian, and so I suspect she'd bring an important perspective to the school board. Jill Davis - Endorsed by people I like. Mentions sustainability. Doug Mann - Doesn't seem to be a serious candidate (Strib photo is awful). Sharon Henry-Blythe - Incumbent, but no candidate photo on Strib. No endorsements from people I know. No campaign website. Kari Reed - Home-schooler. No serious endorsements. Opposes school funding referendum (below). I fail to see how a serious school board candidate can oppose increasing school funding; the job is to advocate for schools and that includes advocating for resources. This is a funding referendum that will increase property taxes. I will be voting yes because I have never heard anything about public schools being in anything other than an urgent to desperate financial situation. My mom was a schoolteacher for many years and always struggled for adequate funding. This expands the school board from 7 to 9 seats and introduces 6 district-based seats. (Currently, all seats are at-large.) I will be voting yes because this eliminates the need for all candidates to run an expensive city-wide campaign and because it ensures that all parts of the city have representation (currently, North Minneapolis regularly gets shafted). I will be voting for Paul H. Anderson (incumbent) because he seems pretty reasonable and Tim Tingelstad is a right-wing nutjob and strict constructionist, just like Scalia and Thomas. I will be voting for Lorie Skjerven Gildea (incumbent) because she seems pretty reasonable and there's strong circumstantial evidence (2nd section) that Deborah Hedlund responds with agreement to racist anti-Obama hate e-mail. I will be voting for Terri J. Stoneburner (inc) because she seems pretty reasonable and Dan Griffith is running to make a statement about judicial elections, not because he wants the seat. I will vote for Philip D. Bush (inc), despite the fact that his name is Bush, because he seems pretty reasonable, is endorsed by people I like, and Eugene Link did not respond to the Strib candidate profile questionnaire. I will vote for Jane Ranum because she's endorsed by people I like and talks about procedural fairness. David J. Piper is endorsed by a bunch of sheriffs, which makes me suspicious. No endorsement here... I couldn't figure it out. James T. Swenson (inc) seems reasonable, endorsed by Arne Carlson, but also Sheriff Rich Stanek (yeccch). Thomas F. Haeg - nothing much interesting here either. He talks a lot about cutting costs, which is often code for right-wing nutjobbery. Anticlimactic, I know... sorry! If you have any ideas, please let me know. Here's another analysis of the Minneapolis ballot which I found interesting: Turtle's Voting Guide: The Whole Darn Ballot. He's more or less in agreement with me, with some more nuanced views on the school board races/referenda in particular. That's all folks! Go vote! This may be the most important election of your lifetime.